↑ "Facebook, 1 billion active people fact sheet". สืบค้นเมื่อ October 4, 2012. ↑ "Facebook Current Report, Form 8-K, Filing Date July 26, 2012" (PDF). SECDatabase.com. สืบค้นเมื่อ July 26, 2012. ↑ "Facebook.com Site Info". Alexa Internet. สืบค้นเมื่อ 2013-01-14. ↑ Tabak, Alan J. (February 9, 2004). "Hundreds Register for New Facebook Website". Harvard Crimson. สืบค้นเมื่อ 2008-11-07. ↑ 6.0 6.1 Locke, Laura. "The Future of Facebook", Time Magazine, July 17, 2007. Retrieved November 13, 2009. ↑ 7.0 7.1 McGirt, Ellen. "Facebook's Mark Zuckerberg: Hacker. Dropout. CEO. ", Fast Company, May 1, 2007. Retrieved November 5, 2009. ↑ Kaplan, Katherine (2003-11-19). "Facemash Creator Survives Ad Board". The Harvard Crimson. สืบค้นเมื่อ 2009-02-05. ↑ Hoffman, Claire (2008-06-28). "The Battle for Facebook". Rolling Stone. Archived from the original on July 3, 2008. สืบค้นเมื่อ 2009-02-05. ↑ Seward, Zachary M. (2007-07-25). "Judge Expresses Skepticism About Facebook Lawsuit". The Wall Street Journal. สืบค้นเมื่อ 2008-04-30. ↑ Carlson, Nicolas (2010-03-05). 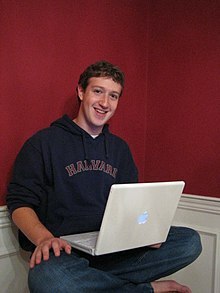 "In 2004, Mark Zuckerberg Broke Into A Facebook User's Private Email Account". Business Insider. สืบค้นเมื่อ 2010-03-05. ↑ Brad Stone (2008-06-28). "Judge Ends Facebook's Feud With ConnectU". The New York Times. ↑ Phillips, Sarah (2007-07-25). "A brief history of Facebook". The Guardian. London. สืบค้นเมื่อ 2008-03-07. ↑ 14.0 14.1 "Press Room". Facebook. 2007-01-01. สืบค้นเมื่อ 2008-03-05. ↑ Rosmarin, Rachel (2006-09-11). "Open Facebook". Forbes. สืบค้นเมื่อ 2008-06-13. ↑ "Online network created by Harvard students flourishes". The Tufts Daily. สืบค้นเมื่อ 2009-08-21. ↑ Rosen, Ellen (2005-05-26). "Student's Start-Up Draws Attention and $13 Million". The New York Times. สืบค้นเมื่อ 2009-05-18. ↑ "Why you should beware of Facebook". The Age. Melbourne. 2008-01-20. สืบค้นเมื่อ 2008-04-30. ↑ Dempsey, Laura (2006-08-03). "Facebook is the go-to Web site for students looking to hook up". Dayton Daily News. ↑ Lerer, Lisa (2007-01-25). "Why MySpace Doesn't Card". Forbes. Archived from the original on 2008-06-02. สืบค้นเมื่อ 2008-06-13. ↑ Lacy, Sarah (2006-09-12). "Facebook: Opening the Doors Wider". BusinessWeek. สืบค้นเมื่อ 2008-03-09. ↑ Abram, Carolyn (2006-09-26). "Welcome to Facebook, everyone". Facebook. สืบค้นเมื่อ 2008-03-08. ↑ "Facebook and Microsoft Expand Strategic Alliance". Microsoft. 2007-10-24. สืบค้นเมื่อ 2007-11-08. ↑ "Facebook Stock For Sale". BusinessWeek. สืบค้นเมื่อ 2008-08-06. ↑ "Press Releases". Facebook. 2008-11-30. สืบค้นเมื่อ 2008-11-30. ↑ "Facebook 'cash flow positive,' signs 300M users". Cbc.ca. 2009-09-16. สืบค้นเมื่อ 2010-03-23. ↑ "Uzbek authorities have blocked access to Facebook". สืบค้นเมื่อ 21 October 2010. "China's Facebook Status: Blocked". ABC News. July 8, 2009. สืบค้นเมื่อ 13 July 2009. ↑ Shahi, Afshin. (July 27, 2008). "Iran's Digital War". Daily News Egypt. สืบค้นเมื่อ August 16, 2008. ↑ Cooper, Charles (2010-05-19). "Pakistan Bans Facebook Over Muhammad Caricature Row – Tech Talk". CBS News. สืบค้นเมื่อ 2010-06-26. ↑ "Red lines that cannot be crossed". The Economist. July 24, 2008. สืบค้นเมื่อ August 17, 2008. ↑ Ben Escurado (2010-11-14). "Saudi Arabia blocks Facebook". TechViewz.Org. สืบค้นเมื่อ 2010-11-16. ↑ Benzie, Robert (May 3, 2007). "Facebook banned for Ontario staffers". Toronto: TheStar.com. สืบค้นเมื่อ August 16, 2008. ↑ Stone, Brad (April 7, 2008). "Facebook to Settle Thorny Lawsuit Over Its Origins". The New York Times (blog). สืบค้นเมื่อ November 5, 2009. ↑ Lewis, Paul; Wong, Julia Carrie (2018-03-18). "Facebook employs psychologist whose firm sold data to Cambridge Analytica". the Guardian. สืบค้นเมื่อ 2018-03-20. ↑ Franceschi-Bicchierai, Lorenzo (2018-03-19). "Why We're Not Calling the Cambridge Analytica Story a 'Data Breach'". Motherboard. สืบค้นเมื่อ 2018-03-20. ↑ Rosenberg, Matthew; Confessore, Nicholas; Cadwalladr, Carole (March 17, 2018). "How Trump Consultants Exploited the Facebook Data of Millions" – โดยทาง NYTimes.com. ↑ Timberg, Craig; Romm, Tony (2018-03-18). "Facebook may have violated FTC privacy deal, say former federal officials, triggering risk of massive fines". Washington Post (in อังกฤษ). ISSN 0190-8286. สืบค้นเมื่อ 2018-03-25. ↑ "Facebook knew of illicit user profile harvesting for 2 years, never acted". ↑ CNBC (2018-03-23). "UK High Court grants Cambridge Analytica search warrant to ICO". CNBC. สืบค้นเมื่อ 2018-03-23. ↑ "Facebook boss apologises in newspaper ads". BBC News (in อังกฤษ). 2018-03-25. สืบค้นเมื่อ 2018-03-25. ↑ Story, Louise (2008-03-10). "To Aim Ads, Web Is Keeping Closer Eye on You". The New York Times. สืบค้นเมื่อ 2008-03-09. ↑ Cluley, Graham (February 1, 2010). "Revealed: Which social networks pose the biggest risk?". Sophos. สืบค้นเมื่อ July 12, 2010. ↑ "Facebook May Revamp Beacon". BusinessWeek. 2007-11-28. สืบค้นเมื่อ 2010-07-18. ↑ "Google AdWords Click Through Rates Per Position". AccuraCast. 2009-10-09. สืบค้นเมื่อ 2010-07-18. ↑ Denton, Nick (2007-03-07). "Facebook 'consistently the worst performing site'". Gawker. สืบค้นเมื่อ 2010-07-18. ↑ "Facebook Says Click Through Rates Do Not Match Those At Google". TechPulse 360. 2009-08-12. สืบค้นเมื่อ 2010-07-18. ↑ Leggatt, Helen (2007-07-16). "Advertisers disappointed with Facebook's CTR". BizReport. สืบค้นเมื่อ 2010-07-18. ↑ Klaassen, Abbey (2009-08-13). "Facebook's Click-Through Rates Flourish ... for Wall Posts". AdAge. สืบค้นเมื่อ 2010-07-18. ↑ "Involver Delivers Over 10x the Typical Click-Through Rate for Facebook Ad Campaigns". Press release. 2008-07-31. สืบค้นเมื่อ 2010-07-18. ↑ Walsh, Mark (2010-06-15). "Study: Video Ads On Facebook More Engaging Than Outside Sites". MediaPost. สืบค้นเมื่อ 2010-07-18. ↑ "Facebook Factsheet". สืบค้นเมื่อ November 21, 2010. ↑ "Facebook's friend in Russia". CNN. 2010-10-04. สืบค้นเมื่อ December 18, 2010. ↑ McCarthy, Caroline (May 11, 2008). "As Facebook goes corporate, Mark Zuckerberg loses an early player". CNET.com. สืบค้นเมื่อ July 12, 2010. ↑ "Facebook Statistics by country". March 3, 2012. ↑ "43.1 Million Members of Facebook in Indonesia". February 2, 2012. หน้านี้แก้ไขล่าสุดเมื่อวันที่ 15 กุมภาพันธ์ 2562 เวลา 17:45 น.